Home Cover Feature GRAFFITI TRAVELERS…grab your daypack and join us on holiday!! GRAFFITI TRAVELERS…grab your daypack and join us on holiday!! Of all the things I post on this blog, our travel plans and reports are the most fun to write. You , my friends….the armchair tourists on our journeys….have no idea how much impact your comments to our “on the road” travel posts mean to Steve and I, and actually add to the fun of the adventure. ABOVE: Cassis France (French pronunciation: [kasi, kasis]; Occitan: Cassís) is a commune situated east of Marseille in the administrative department of the Bouches-du-Rhône in the Provence-Alpes-Côte d’Azur region in southern France. It is a popular tourist destination, famous for its cliffs (falaises) and the sheltered inlets called calanques. My friend Diana and my daughter Liz, and Steve know more than anyone how fun it is after an exhausting day with blisters on the feet, to hit the internet cafe or Iphone with a GRAFFITI GOSSIP report from the day and to respond to all your comments from the previous day’s writings. It’s “comfort food” for a weary traveler’s soul, and I actually can’t wait at the end of the day to seeing who stopped into the blog while we were out. ABOVE: Khan el-Khalili (Arabic: ??? ????????) is a major souk in the Islamic district of Cairo. The bazaar district is one of Cairo’s main attractions for tourists and Egyptians alike. I asked our guide if she knew of any special bead vendors and she got really excited. She loves beads too so we are going shopping!!! In this update, I will post a few images from websites I’ve found (click photos and Wikipedia blue links to access the sites ) which highlight just a few of the places we are considering visiting along the way. I will add to our tenative itinerary in future blog posts the next 3 weeks for you to get a taste of how we plan our trips. Nothing is engraved in stone because we love to “wing it” but a few things like special guides and events that require reservations are good to plan ahead for. 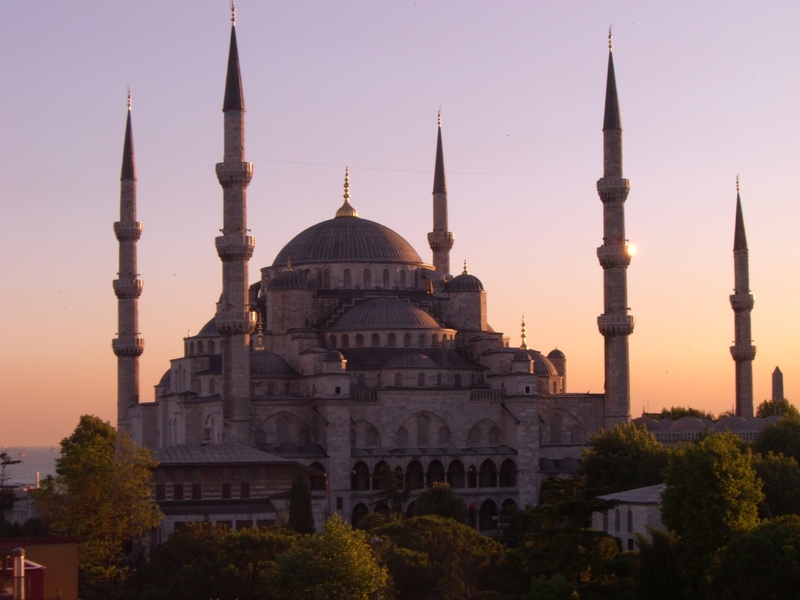 ABOVE: The Sultan Ahmed Mosque (Turkish: Sultanahmet Camii) is the national mosque of Turkey, and is a historical mosque in Istanbul, the largest city in Turkey and the capital of the Ottoman Empire (from 1453 to 1923). The mosque is one of several mosques known as the Blue Mosque for the blue tiles adorning the walls of its interior. The most important element giving the island its peculiar quality is its famous phaetons. In Greek mythology, Phaeton was the son of Helios, who set the earth on fire while attempting to drive the chariot of the sun. Later the word was a 19th century term for a sporty carriage drawn by a single horse. Touring the island with these cars which are pulled by two horses is something I am really looking forward to as it gives me a chance to let the scenery go by for me to photograph, vs. walking and clicking, which is harder for me with my eye issues. Today I’m researching where to eat on this island because I was warned that the main square is not a good place to eat. We like to eat where the locals hang out so it takes a bit of digging up front to find the local digs. ABOVE: Arles France was established by the Greeks as early as the 6th century BC under the name of Theline. It was captured by the Celtic Salluvii in 535 BC, who renamed it to Arelate. The Romans took the town in 123 BC and expanded it into an important city, with a canal link to the Mediterranean Sea being constructed in 104 BC. Café Terrace at Night, also known as The Café Terrace on the Place du Forum, is an oil painting executed by the Dutch artist Vincent van Gogh on an industrially primed canvas of size 25 (Toile de 25 figure) in Arles, France, mid September 1888. The painting is not signed, but described and mentioned by the artist in his letters on various occasions—and, as well, there is a large pen drawing of the composition which originates from the artist’s estate. IF YOU ARE GETTING GRAFFITI GOSSIP UPDATES YOU WILL ALSO RECEIVE ALL THE TRAVEL UPDATES DURING OUR TRIP BEGINNING SEPTEMBER 18, 2009. So when does the next big adventure start? If we get this blog, is this the same one you ask people to sign up for to follow your travels? I read them all and don’t comment often enough and am always too slow to get one of your incredible creations, like the Tide Pools set. I look forward to hearing about your next travels and seeing the photos! Hi Linda and all!! I’ll add that info to this post and thank you for mentioning it!!! Yes, if you are getting blog updates, you will get all the travel updates. I’m so glad you like that Tidepools set Linda!! Thank you for letting me know what you thought of it. I’ll have more on that same theme coming soon!! Since I am financially challenged to travel around the world, it is so fun to follow you in your travels. Can’t wait to see the next trips pictures! Wonderful as always, I am sure. I wish I had time to put a blog together. SIGH Even just spending the weekends at the coast doing the summer market, I have gotten some great pictures this year. Just might need to take a detour up to the light house this weekend, haven’t been up there since this spring. I hope we can get up to the market before the season ends to visit you. I’m so glad you enjoy the travel posts here and hope you get a chance to post and visit LOTS while we are gone!!! In the meantime, go over to blogger and get a free blog to start with. I’m serious…you really need one!!! 5 minutes a week is all you need to post every Monday after your weekend outings!! I’m so jealous you get to travel so much Sandra! I was fortunate enough to go to London and Paris this last May and it just made me hunger for more travel. I guess for the time being I’ll have to live vicariously through you. I’m especially envious of your traveling to France! Hello Mz Gena!! It’s great to see your name pop up here!!! Oh I bet you had a wonderful time on your May trip!! Such a perfect time to go to france. We are doing an area of France this time that we haven’t yet…the southern coastal and wine regions!! It’s going to be fun having a car and just driving the countryside and staying in B&B’s!! Oh YES , I would love to add your pix to the album. Actually Im glad you reminded me to get that back up here again. I was moving it from Image Event to a Flickr album and forgot to repost it on the blog. I love that album of graffiti/wall art!!! I think especially since it’s a shared project full of everyone elses pix! !